Congress reauthorized the Elementary and Secondary Education Act (ESEA, formerly No Child Left Behind) with President Obama signing the Every Student Succeeds Act (ESSA) into law in December 2015. ESSA authorizes the principle funding stream supporting afterschool and summer learning programs, the 21st Century Community Learning Centers (21st CCLC) initiative. Find out more about the status of ESSA planning in your state. The US Department of Education has a map of all state plans and feedback in the federal review process - find your state plan here. The Education Commission of the States has a grid of all state plans currently proposed accountability systems- definitely worth a view. And the Collaborative for Student Success also has a great state based site. For the first time since 2002 (and No Child Left Behind) there is a new education law of the land and with change comes opportunity. Congress passed the Every Student Succeeds Act (ESSA) in December 2015, reauthorizing the nation’s largest education law, 8 years overdue, with many much needed updates and revisions. The new law broadens the definition of school and student success from simply math and english achievement test scores to additional indicators selected by the federal government and by the states. The goal is to enable states and local districts to focus on the whole child and evidence-based interventions that support schools based on more local plans and needs, interventions and supports that can and probably should include afterschool and summer opportunities. 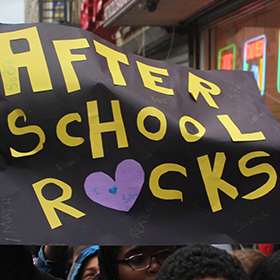 The Afterschool Alliance has an ESSA Toolkit for Advocates page that provides fact sheets, talking points, PowerPoints, background materials, infographics and other aids to help advocates inform themselves and others of the important role afterschool can and should play in student success.It also includes a list of afterschool friendly language in state plans across Titles and plan subject areas. We also have for providers and advocates: 10 questions for school decisionmakers (to download) to ask your child's principal or the principal in the district where you run your program about ESSA. Need some school-day language touch ups? See our Glossary of ESSA terms in the GlESSAry. Want to know who your ESSA coordinators are? See a list here. Georgia: Look at Georgia's State Plan which thoughtfully integrates afterschool programs throughout many sections including whole-child supports, migrant students, health and wellness and career preparation. As a result Georgia is providing over $1 million for wraparound service coordinators in its districts. Ohio: Download Ohio's State Plan to see how they consider community partners as a key component of their evidence based system of student support and school improvement. Plan language includes assisting schools and districts in educating the whole child, especially Ohio’s most vulnerable students, such that the Department will develop and share information regarding implementation of community learning center models. The plan also highlights "utilizing community partnerships to address non-academic barriers can increase district capacity while providing services to students and their families". Indiana: Download Indiana's State Plan to see another example of tying afterschool and summer programs to the states overall goals in student transitions, healthy meals and physical activity, career preparation and hands-on-learning and student engagement leading to drop-out prevention. New York: Schools identified for improvement under ESSA will need to undertake a needs assessment. New York's plan recognizes the importance of that needs assessment expanding to include community partners. "To ensure that all students benefit from school-community partnerships, the Department will require schools and districts undertaking a Comprehensive Needs Assessment as part of CSI or TSI school improvement and creating plans based off of such assessment to incorporate input from relevant community partners that work in the school or work with the students that the school serves in a community-based setting, such as afterschool providers, summer program providers, early care providers, community colleges, health providers, and mental health providers." Connecticut: The plan in Connecticut included surveys from various stakeholder groups and demand for afterschool programs was a highlight across many. The plan also proposed using 1-2% of Title IV A funds to expand statewide initiatives in school, family and community partnerships.Connecticut has additionally published a list of evidence-based interventions from their state of which afterschool programs/extended learning make up a significant part. North Dakota: See North Dakota's plan as a state with a student success indicator around school engagement as defined by a survey. The state plans notes "by using multiple assessment data, each school can transition to a specific action plan or activities; these same activities can provide a springboard to the community and home partnership, as the school assumes the role of the community ‘hub’." Additionally, the plan highlights the benefits of extra-curricular activities mentioing "Student engagement in school social situations, for example, extra-curricular activities, offers the same connection, commitment and accomplishments, in addition to multiple trusted peer and adult relationships, academic success and many social/emotional traits such as time management and self-confidence." Remember, state plans (now all submitted to the US Department of Education) are only the first step. The implementation of these plans at the level of the district and school and the tools, resources and guidance provided by the state will be crucial to ensuring these plans support well-rounded student success in the manner they intend. Title II – Includes teacher professional development including ways where school day and afterschool teachers can work and be trained in coordination. Title IV A has funding for Student Support and Academic Enrichment Grants which can be used to support afterschol STEM, community schools coordinators, and Healthy Eating and Physical Activity (HEPA) among other areas. See a map with some of what state's are planning with Title IV A funds for afterschool. Title IV B funds the 21st Century Community Learning Centers – the largest federal funding stream for afterschool, before school and summer programs. Many Titles require use of a needs assessment: See AIR's State Support Network Needs Assessment Guidebook for how to conduct a quality comprehensive needs assessment. Additional Webinars: Sign up here to learn more. Below is a list of links to other resources and organizations working on ESSA. Where the word "state" is bolded, you can find information specific to individual state plans.